Now in its fourth edition,Horticulture: Principles and Practicescontinues to explore horticulture as a science, an art, and a business, meeting the practical information needs of everyone involved in the discipline from the small urban gardener/hobbyist to the large-scale producer. 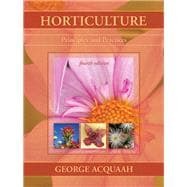 Hailed by many as the leading text of its kind and the best introductory horticulture book available today, this new edition is completely updated to include the latest developments and newest technologies. New features include two sets of sixteen-page color inserts, over 150 new photos, and Industry Highlights provided by twelve horticulture experts. The color inserts are directly and effectively tied to the text and are referenced throughout.